Thomas Jefferson wrote those words in 1776 as the fledgling country known as America severed ties with England. Is it now time for the Auburn Family to declare the causes which impel them to a separation? Our stated mission at the Never to Yield Foundation is to promote a positive image and combat the negativity from anyone who seeks to do Auburn harm. For the last six weeks all of us connected to the Never to Yield Foundation have struggled with this concept. What do we do; what should we do when the negativity and the harm seems self-inflicted? As the Auburn Tigers limped to a 1-5 start, the latest and most egregious offense a loss to moribund Ole Miss, there are many Auburn fans who leaned more and more toward severance. Opinions differ as to what should be severed. At the very least, however, what appears to be a solid majority of Auburn supporters have reached a tipping point. Something needs to change. The muddled mess of the 2012 football season is the catalyst. Who could have imagined that a team with this much promise and potential for success would be so miserably inept in every phase of the game. With the loss to the Rebels, Auburn not only became the sacrifice that allowed Ole Miss to end a 16-game league skid, but the Tigers also replaced the Rebs as the team with the longest SEC losing streak. This isn’t about wins and losses, necessarily. All teams endure seasons that don’t rise to meet even moderate expectations. This Auburn team has plumbed that abyss and seems destined to sink to new historic lows. What we are seeing on the field today goes far beyond the worst anyone could have imagined, worse than even our most bitter rivals could have devised in their darkest dreams. Certain underdogs at Vanderbilt (shocking) at at home against Texas A&M (unexpected) before closing the SEC slate against top ten Georgia and top-ranked Alabama, this Auburn team faces the unthinkable prospect of ending the season without an SEC win. That hasn’t happened since a peanut farmer was in the White House. The last Auburn team to go winless in the SEC? Doug Barfield’s 1980 squad. His last. Before that, Shug Jordan’s 1952 Tigers finished 0-fer in the league, with only wins over non-conference Wofford and Clemson. It was Jordan’s second season at Auburn where he had inherited a team that had gone 5-29-4 in the four years prior to his taking the reins. For the record, Jordan went on to win six or more games 20 times in the next 22 seasons. The current 1-5 debacle is a precipitous fall from the national championship heights of 2010. There are those in the state and national media who would claim that the success of that magnificent season has spoiled an Auburn fanbase unaccustomed to winning. Since the SEC landscape shifted in 1981, only one team has won more games than Auburn. No team can match Auburn’s three undefeated seasons. Auburn is on par with the best of the league in SEC wins, SEC Division titles and SEC Championships. What we see in 2012 is a team that has the capacity to be the worst team in the modern history of Auburn football. That’s unfathomable. It isn’t acceptable. There is no excuse. A few weeks ago we counseled patience. At the time no one could have anticipated the monumental collapse of the football team. We still counsel patience, but now we are compelled to counsel patience with each other. The current state of Auburn football is so dysfunctional that opinions on the resolution will vary wildly and also be rife with passion and pain. It serves no purpose and only strengthens the opposition when we fight from within. Our house cannot be divided. We must stand together as we always have. We must support the athletes. We must support the program. But that does not mean blind devotion. We must view the situation clearly and encourage those with the authority and capacity to do so to take whatever steps necessary to restore Auburn football to its accustomed place. There’s no question at this point that changes must be made. The current path cannot be continued. The question is how pervasive should the changes be? Is it enough to shuffle the internal football staff? 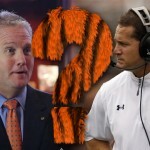 Has head coach Gene Chizik crossed the invisible line of no return? Or does the underlying issue run deeper? The historic implosion of the football team obscures a more painful and enduring truth. Every major sport at Auburn is currently in an untenable state. The Tiger baseball team, once was a perennial NCAA contender, now struggles to make the SEC tournament. In the last twelve seasons, Auburn posted a winning record in SEC play just twice. The Tigers haven’t played in a Super Regional since 1999. Auburn hasn’t made the College World Series since 1997. The Tigers have won a grand total of three SEC Tournament games (3-12) in six tournament appearances since 2000. On a positive note, Auburn has made three straight SEC Tournament appearances (with the expanded format). The Tiger basketball program, while never a persistent national presence, has been competitive. In the last six years it has languished. Former head coach Jeff Lebo never managed to get the program off the ground. In six seasons Lebo broke .500 in the SEC once and had only a single NIT appearance to his credit. Auburn hasn’t made the NCAA Tournament since 2003, and was just 8-8 in the league that season. New head coach Tony Barbee brought high expectations, but faces a difficult task of rebuilding a program that had very nearly bottomed out. In two seasons Barbee is just 9-23 in the SEC. The Auburn women’s basketball team was once a national force. The Tigers had one quality season under former coach Nell Fortner but have otherwise performed below expectations. The overall health of the Auburn athletic program in terms of performance is at the lowest ebb it has been in memory. We have the facilities. We have one of the best fanbases in the country. But something isn’t right. We should not be where we are. We cannot remain here. We love Auburn. We have no doubt that those who make decisions for Auburn at every level of the athletic department share that love. We trust that those who make the decisions will make them in the best interests of Auburn, its students, its athletes, its alumni and its fans. Even if the decision is difficult and even if the decision means letting something you love go. The season is lost, give the QB job to Wallace and let him do what he can! @BB – negative on the plunge! Im working in Montgomery but I actualy live in Pelham. Enjoying the big city!!!! You can’t take people you recruited for a spread offense and play a pro style offense. Al borges came to Auburn and built an offense around the players he had and did well. I suggest taking the rest of this season and developing an offensive and defensive plan to match your players abilities, use the remaining games as practice scrimmages. Start preparing for the 2013 season, who knows you might find something that works and actually win a game. My comment was directed at the negative,” fire everybody,” content of the comments. go read the comments, on the website, ” he only won so many in Iowa”. ” fire JJ.” Fire coordinators,” Not one fan can ” fix ” the problems the football team has this year, nor the baseball team, or any other team. what do I expect?…Expect 100% effort, expect hard work. Celebrate the successes, and deal with the fact, life is not perfect, neither are these kids. realize that we are still dealing with kids playing a game, now that makes sense. REALITY, it is a sport and EVERY MAJOR PROGRAM has good years and bad years. If we win another game this year great! if we don’t? Guess what, my loyalty to Auburn never wavers. People are paid to make the decisions at Auburn University. let them do their jobs. you don’t have to agree with me. That is fine. You don’t have to agree with JJ, or Trooper, or any of them….. As a fan, Simply Support them. I’m just baffled how you can look at the Athletic Department as a whole, and think that we are headed in the right direction. Patience will pay off. No other SEC team has had to deal with the kind of roster attrition Auburn has experienced over the last couple of years. While some of that attrition can be blamed on coaches indirectly or directly, most of it is just bad luck. Meanwhile, Bama and other SEC competitors have been incredibly “lucky” with their more questionable student-athletes. That makes the recent Auburn experience harder for fans to tolerate, but we should be grateful that Auburn is doing things the right way. Coach Chizik knows what it takes to win and the program will soon be back on the right track. Don’t be so quick in pulling the trigger. And don’t air your dirty laundry where the anti-Auburn media segment and fans of other schools can see it. @ Mary you seem to be getting caught up in the fact that because people want results means they don’t support their University. I support Auburn with every fiber of my being. But Auburn is not Jay Jacobs or Gene Chizik. Supporting one and not the other are not mutually exclusive. I support the kids that play the games, they are true Auburn men and women. However, these coaches are paid A LOT of money to produce wins on the field. For you to be ok with mediocrity, is part of the problem. I want my university to excel at everything it does, not settle. This isn’t about Chizik losing games this year, it is about having the worst defenses in the history of Auburn Football under his tenure. It is about lack of fundamentals and player development while he has been the head coach. It is about Jay Jacobs who took an amazing swimming coach and pushed him out the door, about ALL of the Auburn programs that have been on a steady decline since his reign as AD has begun. I will always support Auburn University, I just don’t support some of the people that make decisions. WDE! Brian is wise in the ways of the Bookfaces. Some people seem to equate wanting a change with wavering in your support for AU. Not the case at all. Auburn is unique in a lot of ways, but its fans are no different from those of Tennessee or Florida or Texas or any other major D1 program in wanting their athletic programs to excel or at least be consistently competitive. The numbers speak for themselves under Jay Jacobs’ tenure where all of our programs are concerned. Unfortunately, it’s taken a disaster in our football program to wake people up and make them look at the big picture. ^^^^^That guy gets it. If our loyalty to Auburn wavered when we lost some games then nobody would give a damn right now. If we didn’t expect better, if we didn’t demand better, we would cease to be a MAJOR PROGRAM in no time. There isn’t one fix to all the Auburn programs that are in trouble because they are the result of endless bad decisions by Jacobs. He has to go. In the course of decision making it is helpful if we adhere to the following premise. That which is going to happen eventually, must be done immediately! Our dirty laundry problem comes from a group made up of two factions. AU enemies and AU fans whose whole existence revolves being better than the program across the state and the inability to deal with the cruel jokes and jabs when the pendulum has swung the way it is now. There is a solid base among us that understands the problems with new coordinators and a young QB trying to adjust from shotgun to snaps under center. That’s huge. We’ll recover. Be patient. Jacobs DOES need a replacement, though. This has nothing to do with the program across the state. If that school never had a football program, if there had never been one single crimson fan in the history of the earth the sentiment among many toward this Auburn team would be the same. What is happening on the field is inexcusable. Struggles are one thing. They happen. Teams don’t gel sometimes or the chemistry isn’t right. Sometimes the talent just isn’t there. But there’s a sense that the coaching staff has control and is solving the problem. That doesn’t exist now. The “recruited for the spread” and “adjusting to snaps” argument is — to be quite blunt — utterly ridiculous and doesn’t withstand even the slightest scrutiny. Yes, Auburn will recover. History says we’ll do it quickly. History ALSO says we’ll do it with someone else in charge. Give Gene one more year, I like this recruiting class coming in. I know we are looking at some Juco QB and It has the players we need on defense. We have had a lot of bad luck these last 2 years. Some coaches need to go(wish borges was OC this year)(on the list of possible exit(OC,OL,DL… WR???) We are young and need some team leaders to step up. Prob in the soph ranks bc I don’t see any juniors or seniors stepping up. Pretty much the only program I am counting on right now, is the swim program. 16-straight SEC titles!!! War Damn Swimmers! So…. Worst game in school history this past weekend (Texas A&M)… Most points given up at home, biggest loss since 1914 and most yards ever given up… What now…?